air440® – EMBES Technology (Thailand) Co.,Ltd. The air440® is one of the best innovations of designing 4G LTE Cellular Router with highest performance. The hardware based has designed on embedded system rules that use low power consumption and industrial design so that can be used in the extreme environment including the software design that concerns data security certified by nationwide standard while still maintaining its flexibility during performance. Therefore, you can benefit from air440® to use with the wide range of applications that use Ethernet Protocol and also Serial Protocol in a form of Serial Server. Some of the examples are Video Surveillance, Video Conference, Digital Signage, ATM Machine, EDC Terminal, Data Logger, Data Transferring between Headquarter and Branch, Retail/POS sites, remote printer, new construction locations, temporary office, industrial automation, traffic management, medical, vending machine and much more. Fantastic highlight and innovation on air440® are Battery Backup and Hardware Monitoring, air440® included Battery backup 5000mAh that can backup at least one hour at full load (enable Wifi and use highest power on 3G/4G Cellular Network) and the Hardware Monitoring, air440® could inform you real time for Input Voltage, Battery Voltage, Charging Status and Inside Temperature. With these fantastic features, you would know whole status in advance of air440® including the electric power situation at sites in the REAL TIME. These capability help you control and manage the total network for a high performance with lower administrative costs. As for Port Interface, air440® strength is the provision of 1 WAN and 3 LAN ports which enable to divide Segment for increase the level of security of your data. In addition, you can benefit from WAN Port by connecting with Wire line Network such as MPLS or ADSL. 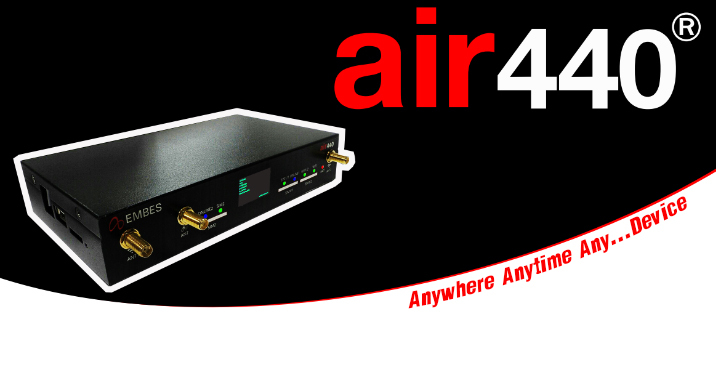 This can be easily accommodated because air440® will choose which network suits your network the best. You can easily configure individual devices through web based configuration and many devices through iManagement, intelligent remote device management software that provides easy setup, configuration, reporting, logging and monitoring for large installations. Also, you can proactively monitor for problem devices including excessive data usage, signal quality, latency, connection history and upgrade thousand devices easily. 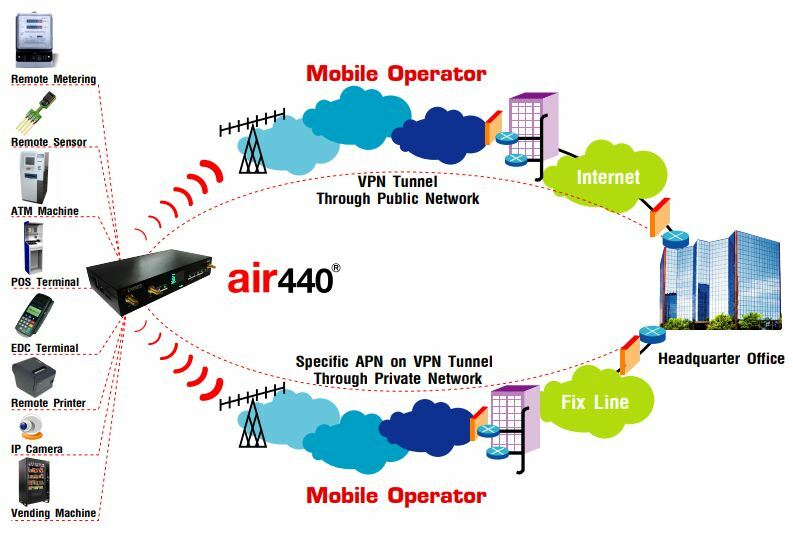 As a conclusion, air440® intelligence can generate new vision to help you decide and choose 3G/4G Network that is fully qualified with speedy, stability, data security and high flexibility. Today, you can be confident selecting 3G/4G Network as your primary network and backup simultaneously in the same piece of equipment. Weight 750 g. (included Battery), 600 g. (not included Battery)!